Wrought iron gates come in a variety of styles, and all of them can add some extra charm to your garden landscape design. The challenge is finding a style you love that fits in your budget. After that comes the fun part; deciding just where and how you're going to use it. L.A. Ornamental offers a number of simple, elegant designs that are priced between $500 and $800. Single gates with more ornamentation start around $900 and more intricate designs with fine details range between $1,300 and $1,500. The company offers same day processing of orders, and orders are dispatched within two days if the item is in stock. Tropical Escape - If you live in a tropical climate or just like the look and feel of a tropical motif, this beautiful ornamental garden gate is just for you. This 2 x 2-foot gate has golden embellishments and a handmade appearance. Retailing for about $1450.00, this is one of the more expensive models available, but it certainly makes a statement. Tuscany - This Mediterranean-style iron walk gate has a beautiful, open design. The 2 x 2-foot size is priced just under $1400.00, and you can also get a double gate for about $2500.00. 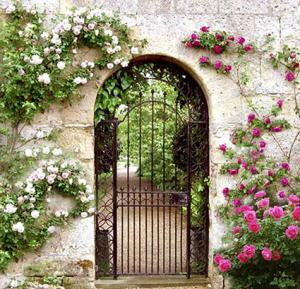 Simply Elegant - If simplicity is what you want, this garden gate has just that. Although it has very consistent lines, it is still incredibly elegant. For about $400, you can get the 2 x 2-foot single gate; for an additional $400, you can get the dual gate. 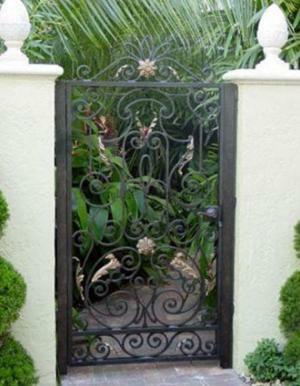 A Rustic Garden promises wrought iron garden gates to custom fit any size opening. Their gates also start at bargain prices so this is a wonderful place to shop if you are on a budget. You can purchase a simple gate for under $200. One of their specialty gates is an arbor gate, which is a gate within an arbor above it that you can use it for growing climbers. Priced below $600, this two-in-one structure is quite affordable. 3-Foot Standard Gate with Posts - Priced around $130, this simplistic gate is a great addition to any garden area. The gate has a charming rustic look to it, but it's also very durable. 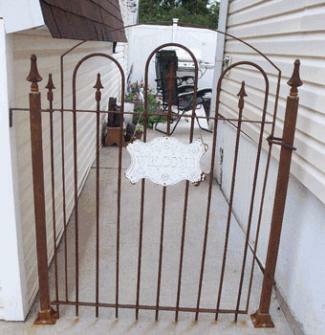 71-Inch Tall Lawless Wrought Iron Gate - If you need a tall gate, this is a great one to choose. It is also 4-feet wide and sports a somewhat "gothic" design. Hand-welded with care, this gate makes a dramatic statement and is priced around $320. White Iron Gate - Simply sweet is a great way to describe this white iron gate. Measuring just 25-inches wide and 45-inches tall, this gate is ideal for small spaces. The lovely gold accents and pretty lines make this gate highly attractive. Priced at less than $160, this gate would be a lovely addition to any garden space. Art Factory wrought iron gates are hand forged in America and "built to last." With a wide variety of styles to choose from, there is something for all tastes. No prices are provided on the site, but you can call the company at 1-800-292-0008 to discuss pricing and further details about any model that interests you. Art Factory ships worldwide. Custom Harvard University-Inspired Security Gate - There is nothing faux about this wrought iron gate, and it can be made to any size your need. Guaranteed to last forever, this 19th century Victorian-inspired gate has beautiful solid lines. Hand Forged Iron Roses Gate - The delicate touch that the roses bring to to this wrought iron gate make it an ideal addition to both formal and country gardens. Historic Iron Gate - Step back in time with this wrought iron gate made with old fashioned methods. No fake finishes or molds are used to manufacture this durable and lasting gate. Each of Artistic Iron Works' hand-forged gates are reminiscent of gates made hundreds of years ago. Each one is made to specification and professional installation is included. The company specializes in single and double gates in a variety of classic designs. Although there are no prices listed on the site, Artistic Iron Works agrees to match any competitors price. They offer free estimates if you call them at 702-387-8688. This company offers international shipping. SG0005 - This gate features a lovely vine motif. SG0014 - This gate design features elegant scrollwork. 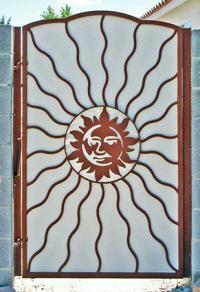 SG0020 - If you love sun motifs, you'll find this gate irresistible. Shopping at an architectural salvage store is an experience unto itself. If there are any in your area, be sure to visit in person. These stores literally rescue architectural items like old wrought iron gates from homes, businesses and buildings being torn down or renovated. Moreover, they may be one of the few places to get real wrought iron since this material is no longer produced on a commercial scale, and what is sold today is often mild steel given the characteristic grainy texture of wrought iron. Here are just a few of the many ways that you can incorporate wrought iron gates into your garden setting. As an entry into garden space - A pretty garden gate can spell welcome while it visually separates the yard and the garden space. 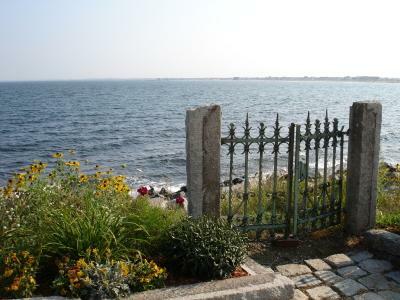 Wrought iron gates can provide privacy without blocking the view. To demarcate different areas - If the garden has different areas for entertaining, flower beds and vegetable patches, small gates can effectively mark the boundaries. To restrict children and pets - Areas that are out of bounds to children and pets, except under supervision, can be locked off with a garden gate. Families with young children will find a gate essential to child safety, especially if the garden has water features or a pond. Exit to outer areas - A garden gate can serve as an exit from the garden into vast outer areas such as meadows, orchards and woods. Repurposing - With a bit of tinkering, old garden gates can be transformed into trellises for climbers. By welding a few brackets to the gate, it can be turned into a flower stand for potted plants. Even fruit trees can be espaliered against these gates, and you can create a very eclectic fence line if you collect enough of them. No matter which style of wrought iron fence you choose, the most important consideration is that it should match the architectural style of your house as well as your garden. Since it will be a permanent structure, search well until you find the right one to suit your taste and budget.